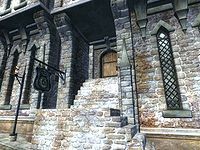 Two Sisters Lodge is the cheaper of the two inns in Skingrad, located in the city's southern half. It is found southeast from the West Gate, next to Salmo the Baker's House and across the street from Reman Broder's House and the Surilie Brothers' House. The proprietor, Mog gra-Mogakh, buys potions and food while only selling the latter. There are three floors in this inn: the lowest floor contains the reception area and dining room; the middle floor contains nothing more than a few chairs and a door to a balcony; and the rooms can be found on the top floor. There are four bedrooms upstairs, two twin rooms and two doubles. The southernmost room, one of the doubles, is the one you can rent. It is spacious and contains a middle-class double bed, three chests of drawers and a writing desk. The other three rooms are all locked and none of the beds inside can be slept in. Despite the name, only one of the two sisters, Mog gra-Mogakh, works in the inn; her sister Ugak gra-Mogakh sells horses at the Grateful Pass Stables just west of the city. If you open the door on the middle floor you will find yourself on a balcony. From here you can jump to the balcony of the Surilie Brother's House in front of you, where you will find a door with an easier lock than the main entrance. Be careful when storing items in your room at the Two Sisters Lodge, as both the lower half of the double drawer and the desk will respawn. The upper drawer and the one standing close to the outer wall are safe containers, however. Esta página foi modificada pela última vez à(s) 21h28min de 17 de outubro de 2013.